Gustav Spörer was a German astronomer who, independently of Richard Carrington, used observations of sunspots to determine the position of the Sun's equator (and hence the tilt of its axis) and to establish that the Sun rotates at different rates at different latitudes. He was the first to draw attention to the lack of sunspots between 1645 and 1715, which became known as the Maunder minimum, but didn't discover an earlier period of low solar activity, which is named after him (see Spörer minimum below). To add to the mixed-up nomenclature, Spörer's law (again, see below) was first noticed by Carrington! 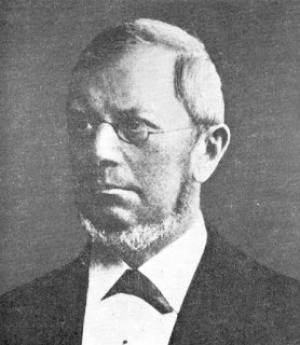 Spörer was born in Berlin and between 1840 and 1843 studied mathematics and astronomy at the University of Berlin. He started his professional career as a school teacher, and only began his solar observations at age 36, using very modest equipment. Spörer shares credit with Carrington for independent and nearly simultaneous discoveries of two solar features of great importance. By the early 1860s both astronomers had accumulated sunspot observations demonstrating (1) the differential rotation of the Sun's surface, as inferred from the apparent east-west motion of sunspots; (2) the gradual equator-ward drift of sunspots in the course of the sunspot cycle (now often called Spörer's law). With his reputation now established, Spörer was invited in 1874 to join the Potsdam Astrophysical Observatory, then still under construction, where he became chief observer in 1882. At Potsdam he he continued his solar observing program and became engaged in historical researches into seventeenth century sunspot observations. By 1887 Spörer had convinced himself that the Sun was behaving unusually in the seventeenth century, with very few sunspots present on its surface. Through careful analyses of extant seventeenth century observational material, he compiled a list of the few sunspots observed during that time period. Surprisingly, this ground-breaking work attracted relatively little attention until it was publicized by E. W. Maunder as part of his own historical studies of seventeenth century sunspot observations. Spörer retired from Potsdam on October 1, 1894. Despite having enjoyed perfect health throughout his life, he died suddenly on July 7, 1895. The Spörer minimum was a period of low sunspot activity that lasted from about 1420 to 1570, based on evidence such as carbon-14 in tree rings and records of auroral activity. The Spörer minimum, and the similar Maunder minimum, coincide with a period of low global temperatures known as the Little Ice Age. It was discovered by the American solar physicist John Allen Eddy (1931–2009) who named it after Spörer. Spörer's law is the observational rule that the solar latitude at which new sunspots appear gradually decreases, from 30° to 40° north or south of the solar equator, at the beginning of a solar cycle, to 5° to 10°, at the end of the cycle. This tendency is revealed very clearly on a butterfly diagram. Although named after Spörer, the "law" was first discovered by Richard Carrington.